سبزی‌‌پرور, علی‌‌اکبر, علیائی, احسان. (773). ارزیابی عملکرد شبکه عصبی مصنوعی در پیش‌بینی تابش خورشیدی کل روزانه و مقایسه آن با نتایج مدل آنگستروم (مطالعه موردی: ایستگاه همدیدی تبریز). مجله ژئوفیزیک ایران, 5(3), 30-41. علی‌‌اکبر سبزی‌‌پرور; احسان علیائی. "ارزیابی عملکرد شبکه عصبی مصنوعی در پیش‌بینی تابش خورشیدی کل روزانه و مقایسه آن با نتایج مدل آنگستروم (مطالعه موردی: ایستگاه همدیدی تبریز)". مجله ژئوفیزیک ایران, 5, 3, 773, 30-41. سبزی‌‌پرور, علی‌‌اکبر, علیائی, احسان. (773). 'ارزیابی عملکرد شبکه عصبی مصنوعی در پیش‌بینی تابش خورشیدی کل روزانه و مقایسه آن با نتایج مدل آنگستروم (مطالعه موردی: ایستگاه همدیدی تبریز)', مجله ژئوفیزیک ایران, 5(3), pp. 30-41. سبزی‌‌پرور, علی‌‌اکبر, علیائی, احسان. ارزیابی عملکرد شبکه عصبی مصنوعی در پیش‌بینی تابش خورشیدی کل روزانه و مقایسه آن با نتایج مدل آنگستروم (مطالعه موردی: ایستگاه همدیدی تبریز). 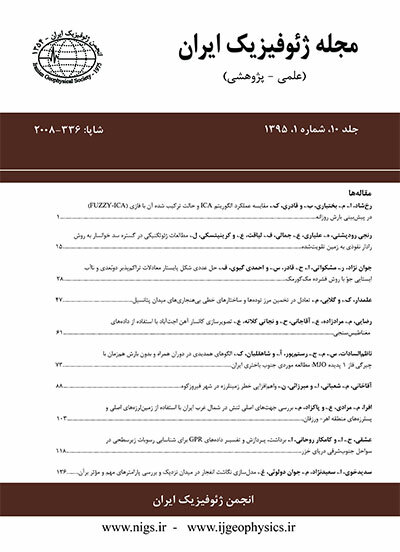 مجله ژئوفیزیک ایران, 773; 5(3): 30-41. تابش خورشیدی جهانی (GSR) یکی از پرکاربردترین کنش‌گرها در بسیاری از زمینه‌های مهندسی کشاورزی،‌ هواشناسی و آب‌شناسی است. در این پژوهش، از یک مدل شبکه عصبی مصنوعی برای برآورد تابش خورشیدی کل رسیده استفاده شد و یافته‌های برآمده از آن با یافته‌‌های مدل آنگستروم به‌منزلة یکی از فراگیر ترین روش‌های برآورد تابش خورشیدی مقایسه مورد سنجش قرار گرفت. برای این کار داده‌های روزانه برخی متغیرهای اقلیمی و هواشناسی بنیادین و نشان‌‌گذار بر تابش خورشیدی ایستگاه همدیدی (سینوپتیک) تبریز در دوره آماری 5 ساله (1380- 1384) درحکم پارامترهای درون داد شبکه عصبی به‌کار گرفته شد. دست‌‌آوردها نشان داد که اندازه RMSE، MBE و rبرای ساختار 1-11-9 برپایه الگوریتم آموزشی پخشیدگی به پس، یکی پس از دیگری، برابر 3/3 ژول بر سانتی‌‌متر مربع بر روز، 134 ژول بر سانتی‌‌متر مربع بر روز و 905/0 به‌دست آمد. روی‌‌هم‌‌رفته، سنجش دست‌‌آوردهای شبکه عصبی با دست‌‌آوردهای مدل آنگستروم و داده‌‌های دیده‌‌بانی شده، نشانگر برتری معنی‌‌دار مدل شبکه عصبی نسبت به روش آنگستروم است. لذا، برای برآورد تابش کل خورشیدی، روش پیشنهادی می‌تواند جایگزین درخوری برای روش‌هایی مانند مدل آنگستروم باشد. Global Solar Radiation (GSR) is one of the most widely used parameters in many fields of agriculture engineering, meteorology, and hydrology. To design a reliable solar energy system, knowledge of the radiation data is essential. Because of high costs of maintenance, calibration, and measurement of global solar radiation, the application of commonly used radiation methods such as Angström models has become popular. In spite of the simplicity and advantages of Angström models, there are many weaknesses in this simple model which may result in unreliable predictions. For instance, Angström models ignore some important factors such as site elevation, relative humidity, and atmospheric turbidity. Since 1924, many attempts have been made for solving such difficulties. During recent years, numerous works have attempted to develop statistical methods, physical approaches (Sabziparvar, 2008), empirical relations, and artificial neural network (ANN) models to predict global solar radiation around the world. Sozen et al. (2005) simulated GSR in different sites in Turkey with an error of less than 10%. Using air temperature and relative humidity data, Rehman & Mohandes (2008) predicted GSR using an ANN method. Jiang (2009) compared the GSR as predicted by empirical approaches with the GSR as simulated by ANN methods in different sites in China. They showed that ANN results are more accurate than empirical methods. In the semi-arid region of Ahwaz, Rahimikhoob (2010) predicted GSR using air temperature and the ANN method. In the present study, an ANN model was constructed to predict global solar radiation and the results were compared to the results of an Angström model. For this purpose, daily meteorological and climatic parameters (relative humidity, mean temperature, maximum temperature, minimum temperature, soil ground temperature, sunshine duration, global solar radiation, cloud cover, and vapor pressure) which affect solar radiation at the Tabriz Synoptic Station during a period of five years (2001-2005) were selected as the input of the neural network method. Three statistical criteria including the mean bias error (MBE), root mean square error (RMSE), and correlation coefficient (r) were applied. The results showed that the best model performance is a 9-11-1 structure and the sigmoid function based on the back propagation training algorithm. The minimum error was obtained by using 10,000 iterations for the training stage and 11 neurons in hidden layers. This study used the trial and error method to find the optimum number of hidden layers. Changing the number of neurons from one to eight in a hidden layer led to larger errors. The application of 9 to 12 neurons improved the results significantly, but higher numbers of neurons (n>13) resulted in error divergence. Generally, the comparison of neural network performance results and Angström model results versus actual measured values revealed a significant superiority of the neural network model compared to the conventional Angström method. Therefore, the proposed method can be a useful tool for the estimation of daily global solar radiation in areas where direct measurement of radiation is not available. The suggested ANN method can be a good candidate instead of the commonly used Angström method. Due to the sensitivity of weather parameters to climate conditions, different ANN methods have to be tested for prediction of global solar radiation for other climates.